Julia Roberts recently signed a deal with Amazon. She’s going to star in a drama called Homecoming. It’s based on a six-part podcast from Gimlet Media that launched in November. The fictional political thriller, created by red-hot Sam Esmail of Mr. Robot (and Mr. Emmy Rossum) fame, centers on staffers at a secret government agency and a soldier that wants to rejoin civilian life. Roberts will play a government caseworker. Amazon execs have already given the series a promising two-season order. She won a Best Actress Oscar in 2001 for Erin Brockovich at age 33 . . . and her popularity has eroded ever since. It’s not for lack of trying. She played a funny villain (Mirror, Mirror) and a complicated villain (Closer). 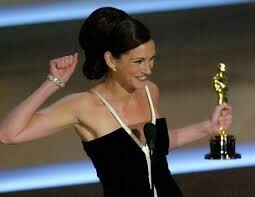 She romanced America’s Favorite Living Actor (Tom Hanks in Larry Crowne) and shouted at America’s Greatest Living Actress (Meryl Streep in August: Osage County). She worked with top-draw directors (Ryan Murphy in Eat Pray Love and Mike Nichols in Charlie Wilson’s War). None it re-catapulted her back into the stratosphere, let alone the pop culture conversation. Her last movie, Money Monster, arrived in mid-May 2016 and was forgotten by Memorial Day. I saw it, and I can’t recall one moment of her performance. In The First Wives Club, Goldie Hawn’s Elise Elliot famously snapped to her dermatologist, “There are only three ages for women in Hollywood: babe, district attorney and Driving Miss Daisy.” That comedy was released in 1996. The outlook has scarcely changed. Since Roberts’ breakout role in Steel Magnolias, busloads of ingenues have arrived in Hollywood. Respected silver foxes such as Judi Dench and Helen Mirren can still chew up a strong supporting role. Roberts — who turns 50 in October — falls somewhere in the dreaded middle. For all the positive buzz surrounding female-fronted films such as Wonder Woman, Star Wars and The Hunger Games, keep in mind that Gal Gadot, Daisy Ridley and Jennifer Lawrence don’t remember the 1980s. When you’re wrinkle-free and exotic, roles still come on silver platters. Not so much when you’re menopausal. Isabella Rosselini recently said as much. Roberts, in particular, is in a tricky spot. She didn’t just cement her fame based on talent. She also possesses that once-in-a-generation combination of radiating beauty, personable Southern charm and a blessedly checkered love life. She ignited headlines in 1991 by placing herself in the center of a love triangle involving then-best friends Jason Patrick and Kiefer Sutherland and never bothered to douse the flames. Remember the quickie Lyle Lovett marriage? The fling with Matthew Perry during the height of Friends mania? Thanking Benjamin Bratt at the Oscars? (She was smitten enough to appear in a 1999 Law & Order episode.) Even her romance with husband Danny Moder was mired in controversy. Now the onetime rom-com heroine is a staid, New Mexico-living married mom of three. She’s competing in a smaller pool alongside gifted age-group peers like Julianne Moore, Nicole Kidman and Annette Bening, all of who can disappear into their roles. Relative lightweights such as Meg Ryan, Halle Berry and Demi Moore haven’t been able to hone in on their turf. Roberts’ sole advantage over all — a magnetic, surefire box office draw — is long gone. Sandra Bullock has more clout in that regard. What’s left? Amazon. The only logical next step. I realize that in 2017, there’s zero stigma in venturing into television. We’re in the golden age and Game of Thrones rules, etc etc etc. Give her credit for adapting to the dreaded new normal. Still, aside from a supporting role in Murphy’s The Normal Heart, I think Roberts held out this long for a reason. (She’s actually doubling down on TV; an HBO series is in the works as well.) Some big celebs aren’t supposed to appear on a tiny screen. The announcement is just another reminder that the market for females stars of a certain age is slimmer than Emma Watson’s waist. But if anyone can forge a path to success in the demo, it’s the former pretty woman. Surely we’ve all learned that discounting her is a big mistake. Huge.